Rohilgad fort is located in Ambad taluka of Jalna district. Most of this region is flat land with hardly any high mountains. 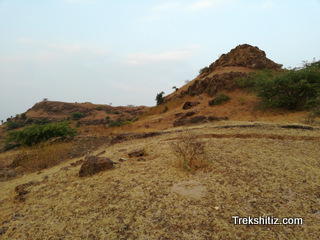 However there are small hills scattered around and Rohilgad fort has been built on one of these hills. The fort has got its name by its base village of the same name. The village of Ambad was an important market place during the Yadav empire and thus this fort was built to keep an eye on the trade route connecting the capital of Devgiri to the market. The fort is located on the hill which is behind the village area. A small road from village takes us in between the cleft of the fort and its adjoining hill from where the climb for the fort has to be started. On the half height of the hill after a 10 minute trail we come across a cultivated farm area. Take a left from here to reach rock cut caves in 5 minutes. The roof of the cave is well balanced on nine pillars. There is a dried water tank near the entrance with steps for access. There are porches of about 3X3 size on the wall opposite the entrance. Another small cave can be seen to the left. Head back to the cleft to ascend the fort. here we can see the remains of fortification wall to the right. We reach the fortified wall in 10 minutes. Below this wall there is a dried up water tank. After reaching the fort top we come on a plateau from where proceed to the left direction. Towards the side of the village there are remains of a mansion and a dried up water tank next to it. While proceeding to the fort summit we come across a stone structure and remains of another structure on the fort top from where the entire fort can be seen. From this point, proceed to the plateau which is on the right side. There is a dried lake here. Moving ahead there is a big ditch and bushes of Babool trees. In this ditch there is a rock cut water tank built on 12 pillars. The fort tour completes after we reach its southern most point. It takes around 30 minutes to visit the entire fort. Jalna city is well connected by roads and railways. Jalna-Rohilgad is 40 kms on the Jalna-Ambad route. One has to reach Ambad from Jalna by S.T. buses. Limited buses are available from Ambad to reach Rohilgad. With one�s own vehicle Rohilgad can be reached from Jalna directly bypassing Ambad.